The Hypertherm Powermax30 plasma cutting system is the ultimate system for metal cutting up to 3/8” (10 mm). It’s designed and built for tough environments but is very compact and weighs only 20 pounds (9 kg). An optional carry case and shoulder strap make transporting the system even easier. 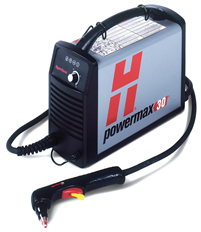 Hypertherm plasma cutters available from Tokentools. Just a short note to let you know that Hypertherm plasma cutters are now available from our online store.